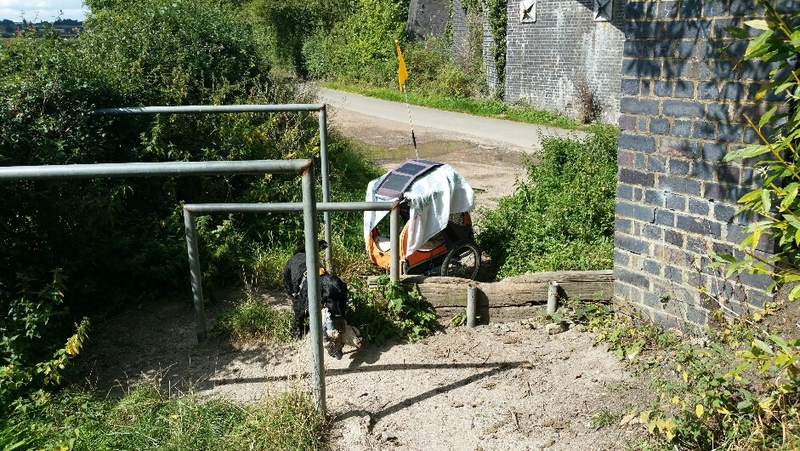 Today’s ride took us through the middle of Warwick, then Leamington Spa and towards Northampton, all on Sustrans Route 41 and nearly all off road – on the Grand Union and the Oxford (? not sure) canal towpaths, and the Lias Cycleway connecting the two. I don’t relish towpath riding, for reasons previously mentioned, but Raisin enjoyed trotting alongside the bike, and must have done 7 or 8 miles like that. There’s no speedometer on board but I think we plod along at 5 or 6 miles an hour. 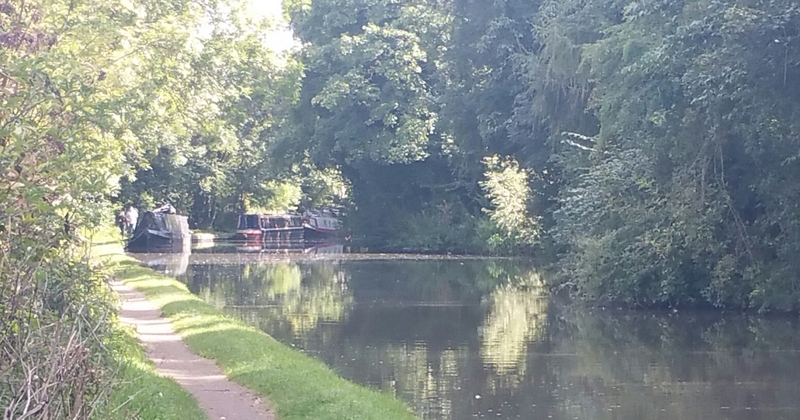 We passed many cruising narrowboats today, mostly hire boats on the Oxford, but privately owned boats on the Grand Union, and nearly all of those were heading upstream towards the big flight of locks at Budbrook, by last night’s campsite. The only one going our way was painted black and called ‘Creeping Death’, which I was glad to overtake. The Grand Union had some impressive engineering, with bridges under and over roads, rivers and railways. We approached one railway bridge at the exact moment the Britannia class steam locomotive 70013 Oliver Cromwell chugged over with a teak service coach, the driver, in blue overalls and denim cap, leaning out to take a look at the line behind. Route 41 was pleasant, and included sections of disused railway line that afforded lovely views of the landscape. 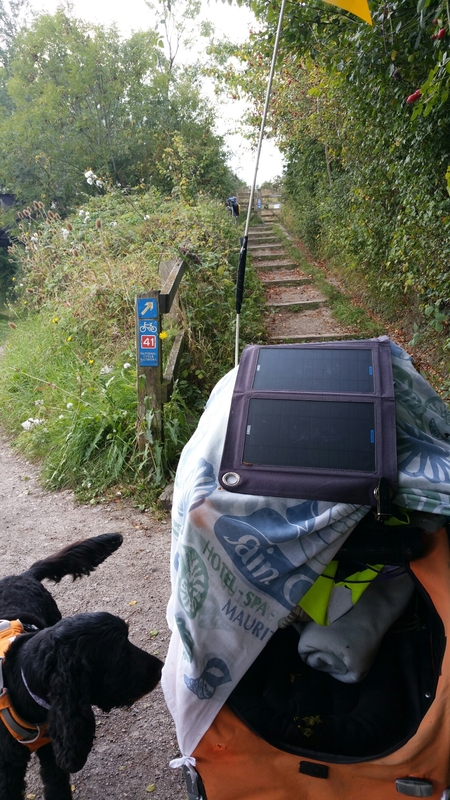 However, it is not very trailer-friendly: three gates along the way meant I had to uncouple the trailer, and a flight of steps onto the Oxford canal towpath was tricky. Raisin even got Mouse out to help at one point. When I rang ahead to book tonight’s campsite, the woman I spoke to managed to call me ‘duck’ 7 times in call lasting just 56 seconds. This got me thinking that the Google Maps app would be better with regional accents. It would give an authentic flavour of the area, and in this way, all the place name pronounciation would be correct too. So here, for example, the voice could say (with a Midlands accent) “In 200 yards turn left duck”. We are about 8 miles south of Rugby now. Raisin and I have been made to feel very welcome at this campsite, another small field essentially, but with homely facilities and a bargain at £5 a night. For once, Raisin is more tired than me but it was good to see her running so well on all four feet today. We might push on to Daventry tomorrow, and will then be about 100 from Bury St Edmunds I think. At this rate we might even be home by Christmas.